Simple Hair Masks For Healthy Hair! Do you struggle with bad hair days through the week? Do you wait for weekends to treat your damaged hair? If your answer is yes, then your hair needs attention and some tender love and care. Let me unfold some simple effective and inexpensive ways to treat your hair. These are not time consuming and do not require exotic ingredients. The solution for good hair lies in your kitchen. 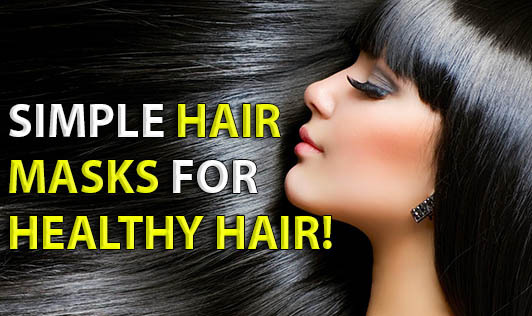 All you have to do is spend a little time to own lustrous and healthy hair. • Add a few drops of almond oil to one big ripe mashed banana. • Mix it well and apply it thoroughly onto your scalp and hair. • Wash it with a mild shampoo after 15 to 20 minutes. • Mix a table spoon of honey in a cup full of milk (with fat). • Apply it evenly on your hair. • Wash it off with a mild shampoo after 15-20min. • Massage it on damp hair. • Let it stay for 10 to 15 minutes and wash it with a mild shampoo. • You need 1 tablespoon of fenugreek seeds soaked overnight and a handful of hibiscus leaves or neem leaves. • Grind this into a fine paste and apply it onto your hair. • Take one whole egg and beat it. • To this, add 6 tablespoons of yogurt. Massage this mixture onto your scalp. • Wash out with a mild shampoo. Each one of these masks has its own advantages. It controls hair fall, premature greying, and dandruff and conditions your hair well. It also promotes hair growth when accompanied with a good oil massage at least once a week. Pamper your hair twice a week with either of these hair masks for the magic to unveil!